So at this stage of my life, I still wasn’t permitted to venture as far from home as the local 7-11. This was due to the fact that the 7-11 was across Horseblock Road, a main thoroughfare. I cold go as far as the shopping center across the street, but not across to the 7-11 itself. And being essentially a good kid with maybe too much respect for authority, the only times I violated this restriction were when egged onto by friends–and even then, I never dared to but a comic book there, fearing that my parents would see it and discover my transgression. As though my parents had any working knowledge of my comic book collection. So it was an almost-boon when a small candy store opened up in that shopping center across the street, complete with a comic book rack. I call it a mixed boon because it seemed to be stocked only with issues of recent vintage, and almost never updated. More crucially, it was the one and only place I was ever admonished by a store clerk for looking at the comic book rack. They has a copy of DC SUPER-STARS #10, the Strange Sports issue with the ballgame between the heroes and villains of the DC line. I wasn’t reading it, just flipping through it as I considered a purchase when the owner came up behind me and growled, “Is it good? This isn’t a library!” I was so mortified that I didn’t buy the book, which should have been an easy sale. This store didn’t last long, and given my experience, it’s no surprise to me. The one and only comic book that I bought in that candy store was this issue of SUPERMAN. It was already old–I owned the second part already, which may have been what pushed me to pick up this earlier issue. And so, because I had read the follow-up already, much of the story’s surprises were wasted on me–I knew them already. 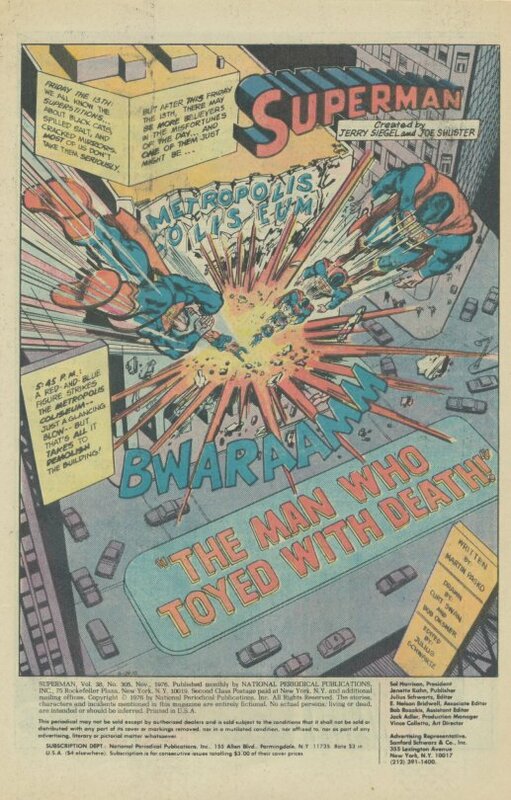 The issue opens up with Superman careening into a building, causing a ton of damage but no fatalities. 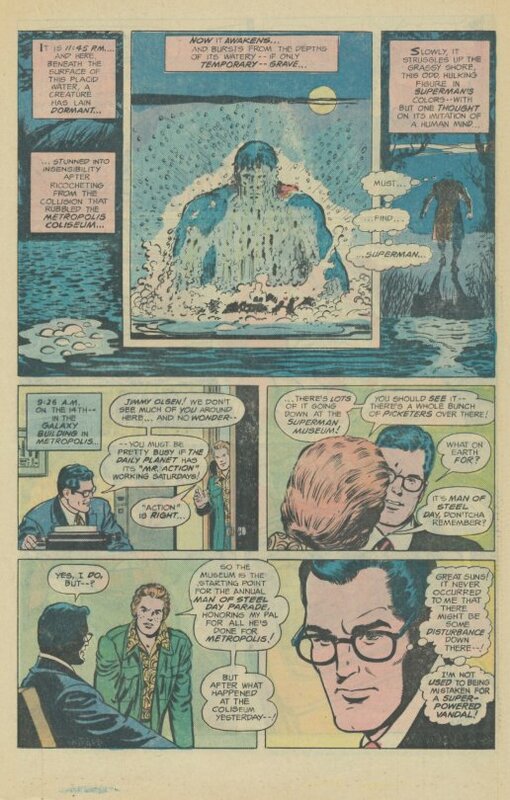 At his WGBS news broadcast, Clark Kent is mystified by the news, as he was nowhere near to the Coliseum that was struck. more urgently, Winslow Schott, the reformed Toyman, has a display of his hand-crafted toys there, which were obliterated. Believing that Superman was responsible for the destruction of his life’s work, Schott snaps once again and resumes his criminal career as the Toyman. His first move is to assassinate Jack Nimball, the latter-day Toyman who had adopted Schott’s mantle. 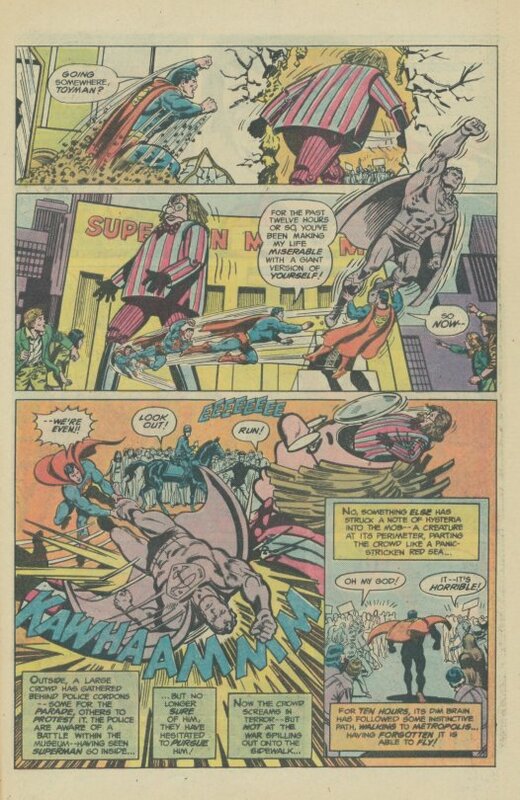 The Toyman takes to the streets in a giant robot and attacks Superman, explaining his grievance to the Man of Steel and pledging to destroy Superman’s legacy just as his own has now been obliterated. 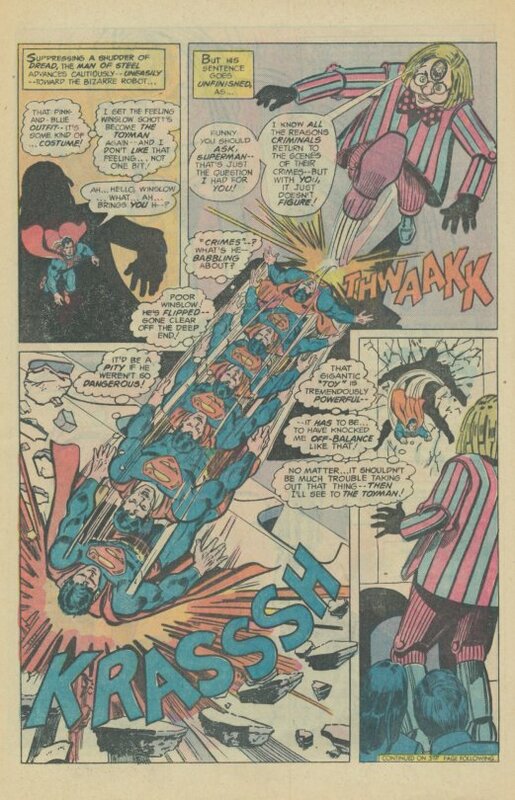 The Toyman escapes by imperiling innocent people and making his departure while Superman is busy rescuing them. Elsewhere, a shadowy figure in a Superman costume emerges from the shore, intent on seeking out the real Superman. 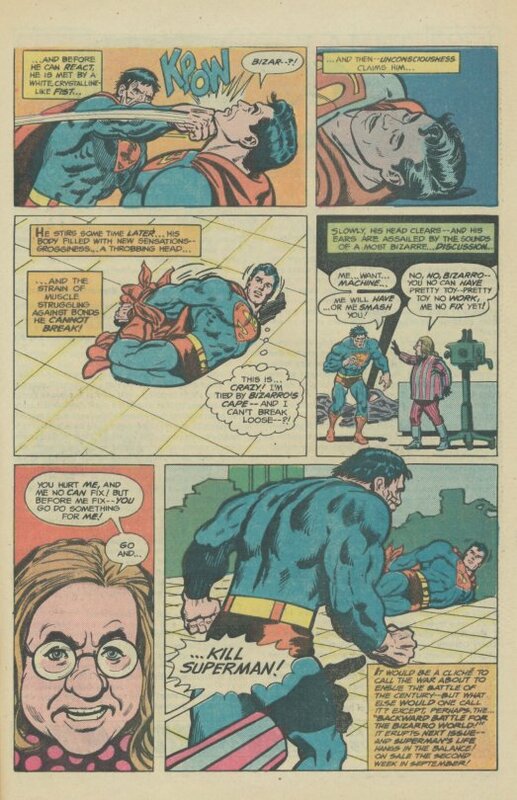 Thinking that the battle is over, Superman is surprised by Bizarro’s arrival, and the mockery clobbers him into unconsciousness with a single punch. Awakening later, Superman finds himself hogtied with his own cape while Toyman and Bizarro parlay. 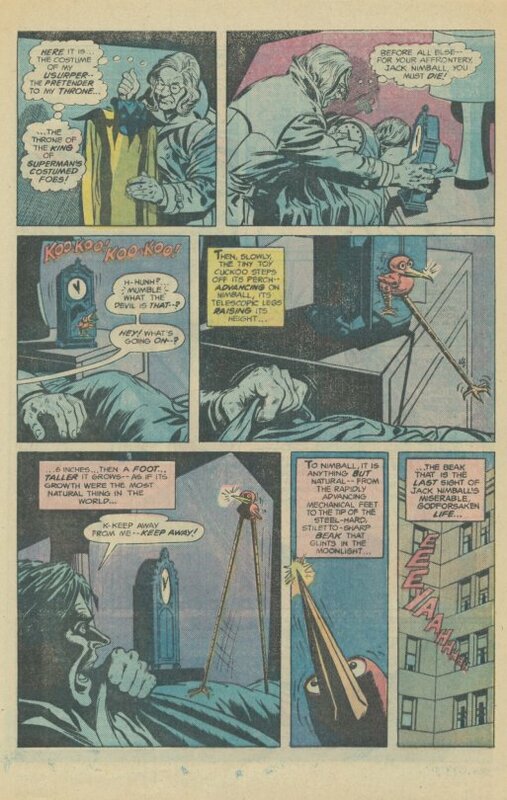 Bizarro is after the Duplicator Ray in the Superman Museum, and Toyman promises to repair it for him, if only Bizarro will kill Superman for him. And the issue ends with Bizarro advancing on the helpless Man of Steel. It’s a decent issue, but lost almost all of its impact for me due to the fact that I already knew the outcome.